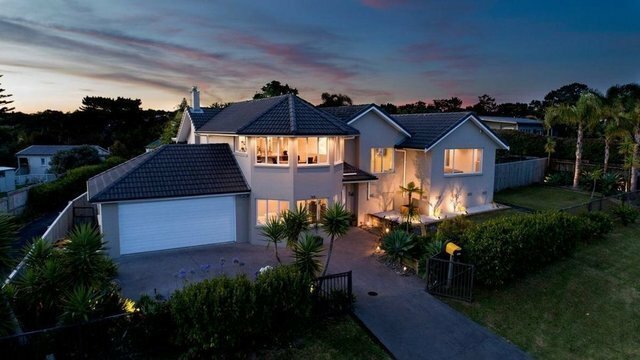 This 290sqm property is an inspired family haven of sophistication and flair. The unique design and high level of luxury will appeal to those with a passion for the extraordinary. Enjoying an elevated position on Woodlands Crescent, this home offers easy access to Browns Bay with it's eclectic collection of shops and café's, the beach and in future, perhaps the ferry. The epitome of designer living, the Brick and tile construction and the sheer magnificence of the views make this property a rare find indeed. The views come compliments of the Chef! The elegant lounge opens to a deck which overlooks the sundrenched garden and valley views. An ever-changing vist perfect by day or night. There are five bedrooms with an office and two spacious bathrooms. The superior location makes this property a must to view.